Keynote speaker Vivian Phillips set the tone for the University of Washington Bothell’s second annual Diversity and Inclusion Conference. The University of Washington Bothell's second annual Diversity and Inclusion Conference drew hundreds of attendees from across campus and the broader community. Academic, community and corporate experts provided interactive workshops during the conference held in partnership with T-Mobile. Chancellor Wolf Yeigh shared with more than 200 attendees the University's successes and opportunities for growth in diversity and inclusion. T-Mobile Director of Diversity and Inclusion, Holli Martinez, a 2008 UW Bothell grad, said the company views diversity as part of its brand. Under her leadership, T-Mobile has experienced tremendous growth in employee diversity and allyship groups across the country. Photo: Chancellor Yeigh participates in the Courageous Conversation workshop. Longtime community advocate Vivian Phillips, chair of the Seattle Arts Commission, delivered a moving keynote speech at the Activities and Recreation Center before the group broke into workshops on having courageous conversations across cultures and experiences, developing tools for advocacy and action, and finding allies in promoting an inclusive work environment. Kristina Hayek was one of the corporate attendees who participated in the Advocacy and Action workshop. “I liked that the workshop was based on the platform of Martin Luther King Junior’s model for advocacy and that we formed teams that included students, educators, and the business community. Each team came up with a project based on the model. That was a really great exercise,” said Hayek, the regional instructional design and development manager for the Hexcel Corp., a global manufacturer of composite materials. 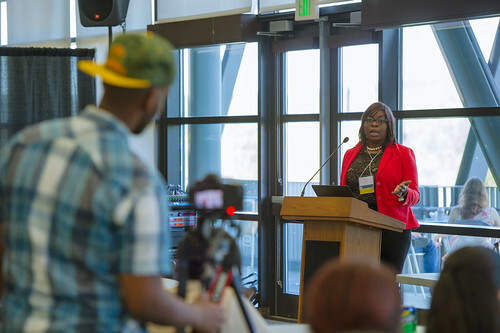 After picking up skills in embracing differences to strengthen teams and organizations, conference attendees voted on presentations from four groups of students vying for a T-Mobile grant. They pitched their diversity projects in a Shark Tank-like competition. Photo:The vote was close, and the winner is a project called Abroaden. The cross-disciplinary team members, all first-year students, Anchala Krishnan, Gabriela León, Leah Shin and Warisha Soomro, explained it will be a phone application to expand social and community involvement with neighbors who share their culture. Abroaden will receive up to $5,000 plus coaching from T-Mobile executives at their Bellevue campus to bring their project to fruition. T-Mobile also will feature the project on its internal diversity and inclusion web page and create a video showcasing the project's progress over a year. Director of Diversity Terryl Ross and Director of Alumni Engagement Sean Marsh co-organized the conference with a steering committee that included representatives from T-Mobile, community colleges, and Bothell police.